Movienizer is primarily a movie organizer. But information about a movie would not be complete without people that created the movie: actors, directors, screenplay writers. Furthermore, we often decide if we want to see a particular movie by looking at its list of actors or by checking who directed the movie. Movienizer includes a number of special tools to work with persons. First of all, it is possible to download information about persons (directors, screenplay writers, actors and composers): photos, biographies, complete filmographies. After doing so, you can check movies from the filmography of your favorite actor / actress, finding the ones that you haven't seen yet. Similar to movies, there are two groups of persons in Movienizer: those that are "In collection" and those that are not. Normally persons are put into your collection when you download information about them (biography, filmography, etc. ), but you can also do that manually by ticking the "In collection" field. 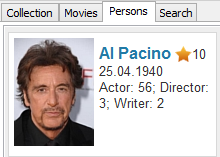 The "In collection" status can be used to build a list of your favorite actors, directors, writers, and composers. If you don't download information about persons and don't add them to your collection manually, the "Persons" tab in the left part of the window will be empty. We can see that there is not much information, but the actor played in the "Cinderella Man" movie. So, he was added into our database when we downloaded information about the movie. It is possible to delete the person from our database. As a result, he will also be deleted from the movie cast. If you delete a person that took part in several movies, the person will be removed from all movies. It is not recommended to delete any persons. If you downloaded information about some person but do not want to keep the person in your collection, just remove the "In collection" check mark. 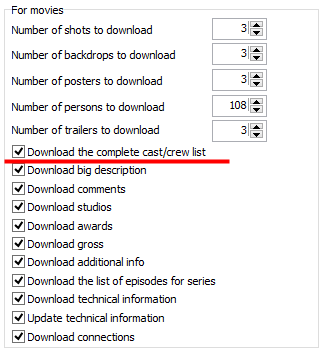 You can enable it to download complete cast and crew lists. Download photos with movie info. Enable this, if you want to download photos of actors, directors, screenplay writers, composers when downloading information about movies. 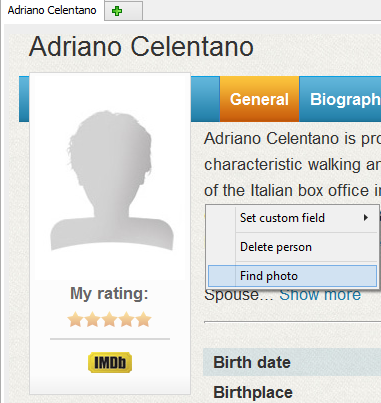 Next to the field, you can specify for how many persons photos should be downloaded. 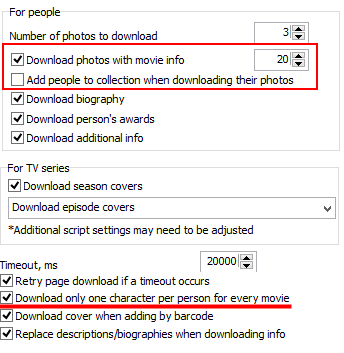 Remove the checkmark, if you do not want to download any photos together with information about movies. Add people to collection when downloading their photos. Movienizer can set the "In collection" flag for the persons with photos. 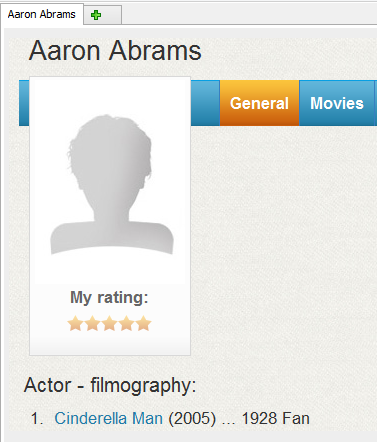 This does not mean downloading any additional details (like filmography, biography, etc.). By default the option is disabled. Download only one character per person for every movie. This option can be helpful if you download information from several online movie databases. They may have different names for the same character. Sometimes character names are changed or updated even within a single online database. 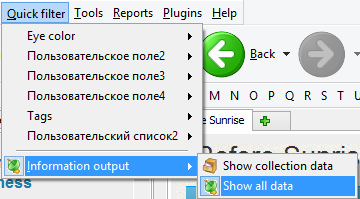 This option allows updating the same record instead of creating duplicates. However, it may not work well for movies where one actor plays several characters. 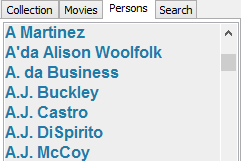 You can download information about persons using the "Add person" button on the toolbar of Movienizer. Alternatively, if the person is already available in your database (for example, he or she took part in a certain movie), you can click the person's name on the movie page (this opens the person's page) and hit the "Download" button on the toolbar.